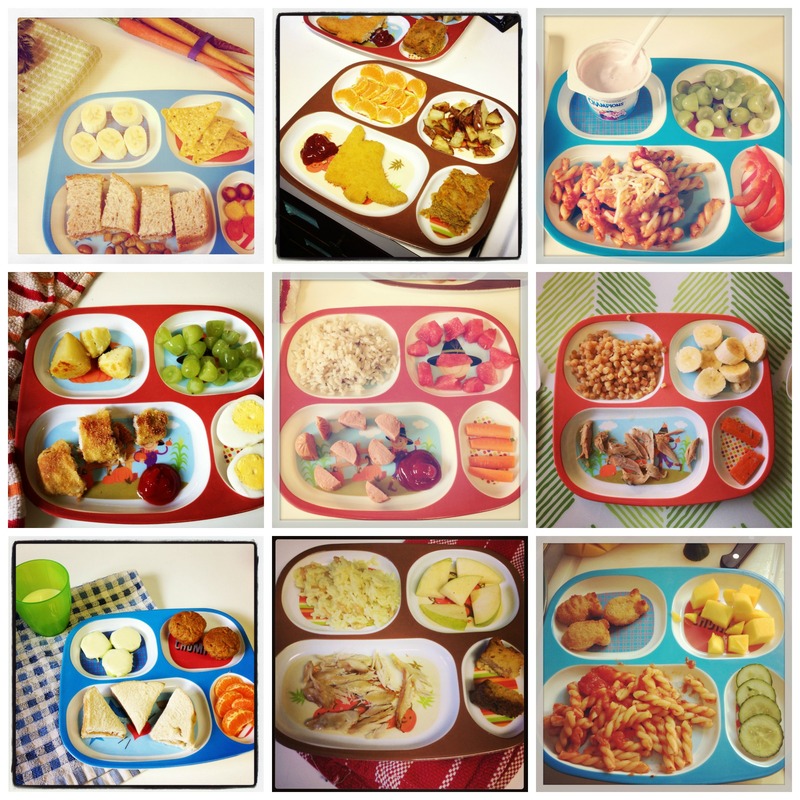 Cute Dinner Trays for Kids – Giveaway! This year, I learned a more refined way to describe the phenomenon of picky preschoolers from my son’s nursery school teacher. Instead of calling them “picky eaters,” she says they have “discriminating palates.” Isn’t that nice? After I shared some of the struggles of dinner time at our house, many mothers shared with me that they go through the same thing. Or at least a similar thing. It’s always encouraging to find solidarity with other mothers. Even more encouraging were the reports from mothers of older children who said that, yes, it *is* possible for a previously discriminating palate to expand its preferences. But it doesn’t happen overnight. And while we’re waiting for it to happen, why not have some fun with the presentation of dinners which may or may not be eaten? 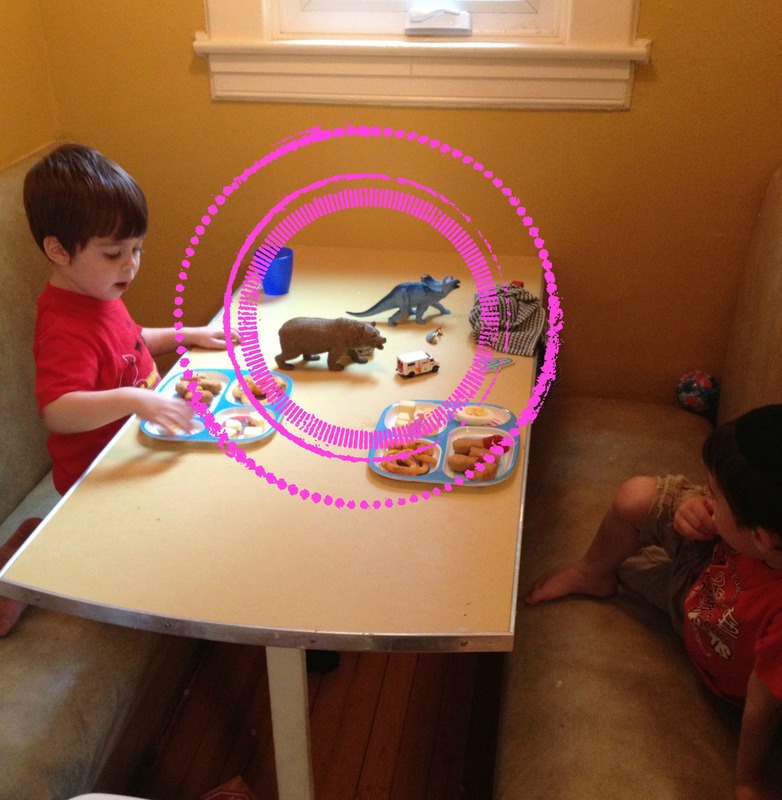 My kids love these plates, and if I dare to leave one slot empty, they call me on it. Usually I end up filling it with fruit. Or frozen french fries which I bake (though sometimes my three-year-old is deeply scandalized by my baking them. He would like to sample them in their raw state). When I post a dinner pic on Instagram or the blog’s Facebook page (have you liked that yet? ), there’s often someone who asks where I got the plates. Just the dollar bin at Target, which I do check routinely. Something they have plastic dinosaur and animal toys! Score! Well, today you do not have to take a trip to Target to get one of these plates. The last time I was there, I stocked up and now have twenty plates to give away. That’s right! To enter, all you need to do is leave a comment sharing the most surprising food your child has eaten, or, if it’s easier, share their favorite food. IMPORTANT: Please also indicate the number of plates you need for your family (I ask that you limit it to one per child). I will select winners (randomly, as always), until there are no more plates to give away. My child ate borscht while at Bubby’s house and I was kvelling. Three plates, please. The giveaway will end in one week, at midnight on Sunday, November tenth. I’ll announce the winner(s) in my post for that week (which will probably be on either Sunday or Monday). The winner(s) will have 48 hours to respond, and I will notify them through email as well (so don’t forget to include a real email address!). Okay, I think that’s all the technical stuff. If you ever want to take a picture of cute ways you arrange your dinner, I would love to see them! Please send then to me! The email address you should send them to is marriedlane [at] gmail [dot] com. Happy food arranging, and good luck! Previous Post Can A Mommy Foster Her Own Talents? Well, my 20 month old seems to be on a noodle only diet, with occasional forays into white bread and bananas–but I try! I don’t have children but I do have a niece that I watch a lot and shes starting to get to the age of eating big people food. She once took a handful of my rosemary mashed potatoes off of my plate, ate it, and then tried to reach for more before I caught her. Lol. I only need the one plate please. When my kids got old enough to appreciate my chicken soup, I felt like I’d reached a certain level of Jewish mom. I have four kids, but only two would appreciate the plates. One of my discriminating palates who subsists mostly on peanut butter, pretzels and grapes ate schnitzel on Shabbos! And if we get picked could we please have 3 plates? My discriminating palate child lives broccoli. Go figure. One plate, please. From begging for salad and chickpeas to not eating “normal” child-friendly favorites, my daughter never ceases to amaze me. I think the most impressive thing that she eats is brussel sprouts, as I didn’t even try them until last year, in my 24th year of existence. She has now been eating them since her 3rd year of existence. My extremely picky eater child (low weight, FTT, the works) eats tofu roasted with sweet potatoes. My son ate gefilte fish on shabbos. I thought he would eat it every week. I think it was a fluke! one plate please. My 10-month-old eats just about anything (poo poo poo). Today I discovered his love for green olives! One plate with a cherry on top. My 2 year old actually likes snap peas? she likes to take the little green pieces out and eat then. 2 plates please! My 23-month-old eats raw green pepper and onion as a snack while we are making supper, loves sauerkraut and sausage, but thinks there is something weird about jello. One plate please. my kids love brown rice, quinoa and bulgur. if i serve that with a protein they’ll usually skip the protein and only eat the grain! I think you’re out of plates by now, but I thought I’d add my comment to the mix just for the fun of it. My 7 -year-old has been eating curried cauliflower since he was little and counts it as one of his favorite foods! The giveaway is random selection ( instead of first-come-first-serve), so you just might get a plate (2 for you?). Picky eater #1 in our house at a whole bowl of split pea soup! Picky eater #2 in our house kept asking for more omelet this past Sunday morning! Poor kid was quite disappointed when there was no more. Can we have 2 plates please? My kids LOVE chicken and steak. We love using sectioned plates for dinner! My son loves spinach, he’s my only kid who loves it. I would love 2 or 3 trays. My oldest, who’s pretty picky, surprised us by asking for “green” (pesto) on her pasta. I had given her plain, as usual. We mixed some “green” in and she finished the whole plate, and even asked for seconds! My second LOVES spicy foods, even ones that border on too hot for me. Can we get 2 or 3 plates please? I was Vaearay surprised last week when my 2 in a week year old ate pickled brisket and LOVED it! But then again, he also liked plain salt. Lol. If we win, 2 plates please! Today, my little guy asked for a green bean that I was trimming and proceeded to eat it raw. I thought he would just throw it on the ground and walk away. If I win, I’d need two plates please. Thanks!